We measure cognitive and emotional processes in real contexts. Eye square neuro methods meet the newest technical standard. For the measurement of brain activity during the brand contact, eye square uses the latest Brain Computer Interface EEGs and its own software to record the analysis. In conjunction with the other implicit real-time brain activity indicators, brain activity constitutes an important contribution. “With the featured measurement of neuro-economically based surveys and analysis of holistic brand impact the effectiveness and efficiency of branding can be tested and insured in an objective analytical way, without having to fight subjective battles. 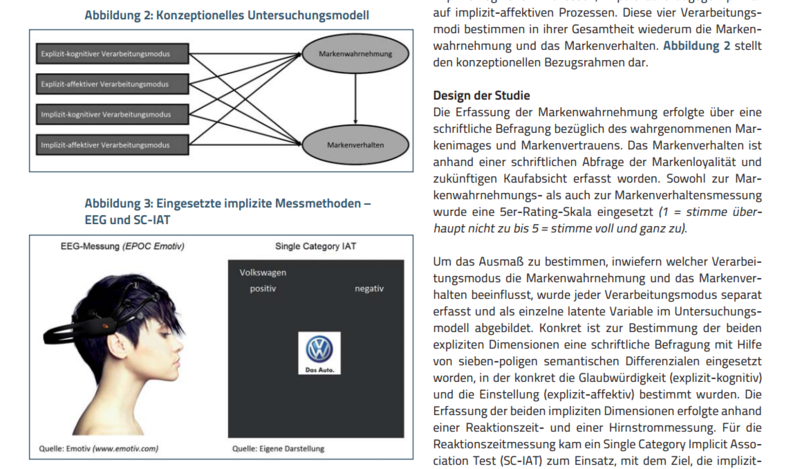 Dr. Nadine Hennigs and Dr. Steffen Schmidt, Leibniz University Hanover for determining integrated brand performance against explicit and implicit survey techniques.